The fleet launched at 12pm from the sandy beach at the Hohe Duene resort. All went well except for one unfortunate SUI sailor who got into trouble behind a wooden breakwater. He couldn’t get the boat moving away enough to get his rudders down and, after jumping into the water in an attempt to fend the boat off the structure, it capsized and a shroud slipped between the wooden slats, resulting in his mast breaking and smashing his tiller off. The now inverted DNA F1 was eventually freed and swam/drifted ashore with an understandably upset sailor. On the course, the conditions where roughly the same in both races with breeze of 12-13kts, meaning that it could be a fully foiling race through the light rain. However it was swinging about so there was not really any favoured side. But the previous nights wind had created a bit of a sea running, with 1m waves coming in. Those who could, managed to foil surf in these conditions enabling them to get good speed and depth before they invariably dropped off the foils. But it was the accompanying seaweed that did for many of the fleet. The stuff was the long stringy stuff that caught around the foils and rudders causing them to loose lift and dump the unfortunate sailor back down again. The decision to clear the weed became a tactical one, as do you try to sail though hoping it drops off, or do you stop and clear it. Many lost places as a result of their decisions either way. The race one bullet was again taken by Glenn Ashby in his usual clinical style on the DNA F1x. Manual Calavia on his Exploder Ad3 was chasing, but never really challenged the America’s Cup winner in the race. SUI Champ Sandro Cavieziel on his modified Scheuerer G7 came in a good third from Mr Bryt Sails, Maciej Zarnowski. Further down the fleet former double World Champ Mischa Heemskerk seemed to be struggling. Maybe his new shaped pinhead sail wasn’t the thing for those winds as his finished 13th. The day’s second race started the same, but half way around the breeze started to die and those who spotted this first had to decide at which point to switch to a low drag mode. The Classics, of course, had no such dilemmas as they just seamlessly switched and went deeper. One such was Micky Todd, who finished a good 9thon this Schuerer G6. Glenn was just leading Manuel at the bottom on lap 2 when his starboard rudder pin became detached causing the thing to swing about. He stopped to raise it but by now Manuel, and a very happy Benoit Marie, at his first ‘A’ Cat regatta, took 2nd. After the race, an impromptu pit crew of Paul Larsen and Adam May set about Glenns boat with carbon and resin under the Forward WIP sponsors tent, much to the amusement of Glenn and other onlookers. Tomorrow will tell if they were successful. The dying wind, weed and the waves really shook up the pack and sailors places changed dramatically as a result. There is still all to play for probably from 2ndplace down. 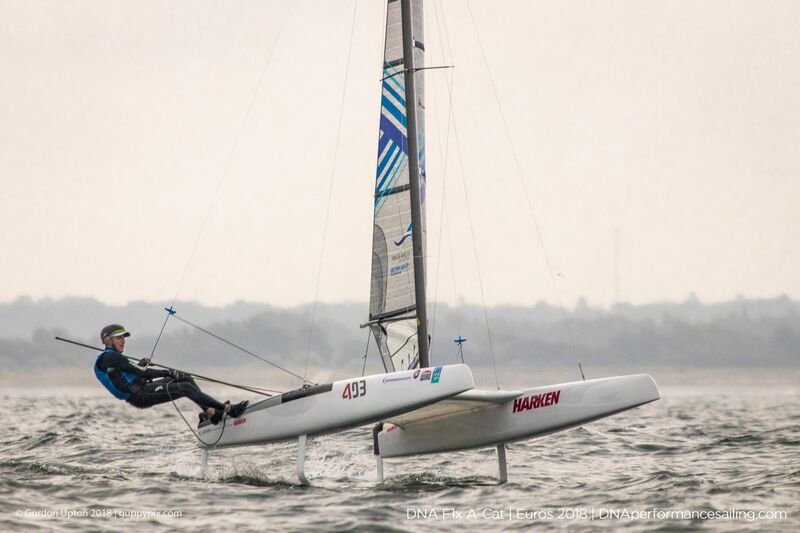 Tomorrow promises another marginal foiling day, and possible rain again. We await with anticipation to see how this will play out.